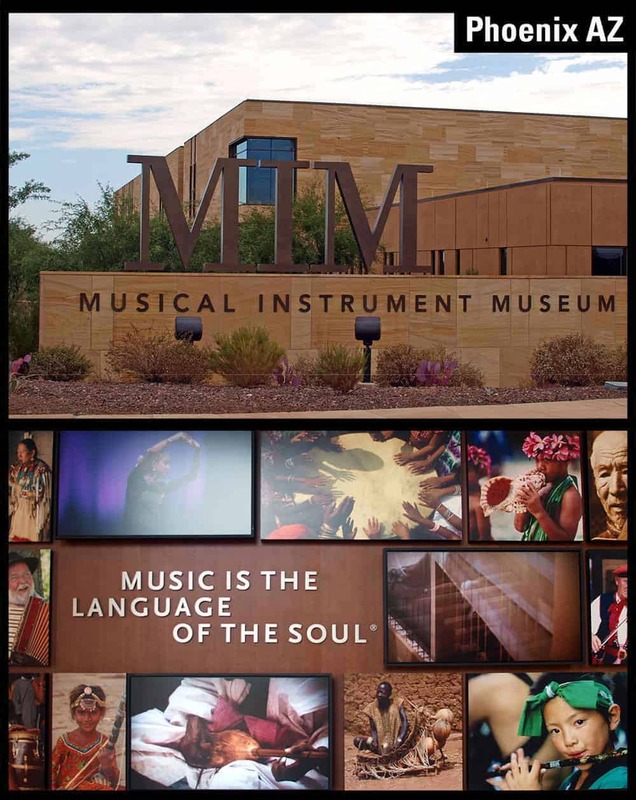 Located on a 20-acre site in North Phoenix, the Musical Instrument Museum (MIM) is the perfect place to escape the heat and lose yourself in culture, music and wonder. The building itself is incredible if you are a fan of architecture. Designed by RSP Architects of Minneapolis, MN, the exterior walls of Indian sandstone compliments the surrounding desert and the cactus/sculpture garden complete with water feature outside is a nice contrast to the stone. Inside the Venetian plaster walls, Italian porcelain floor tile, stainless steel and glass. It’s like an oasis in the desert. But, enough about the building. 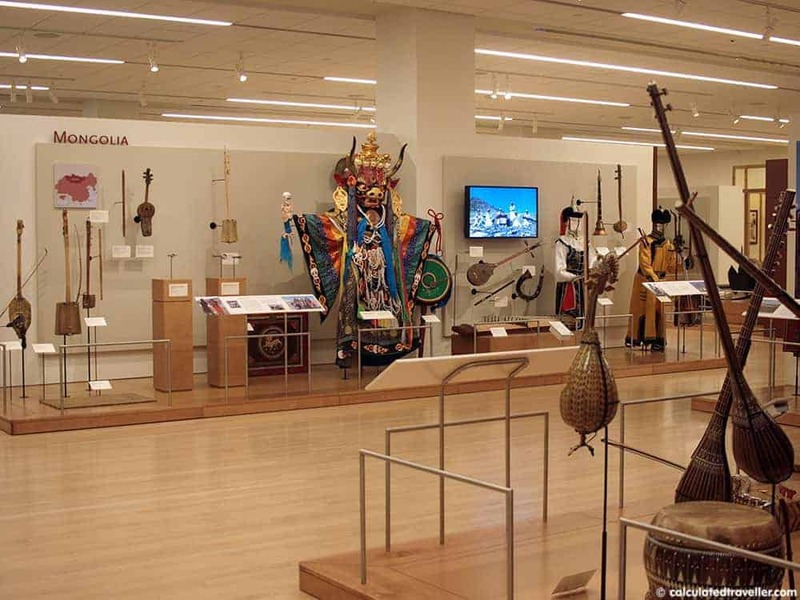 The MIM has a collection of nearly 15,000 instruments and associated objects (approx. 6,000 are on display at a time) and was built at the cost of $250 million. The curators of the museum worked hard travelling the world to collect and showcase the diversity (and the similarities) of the instruments. 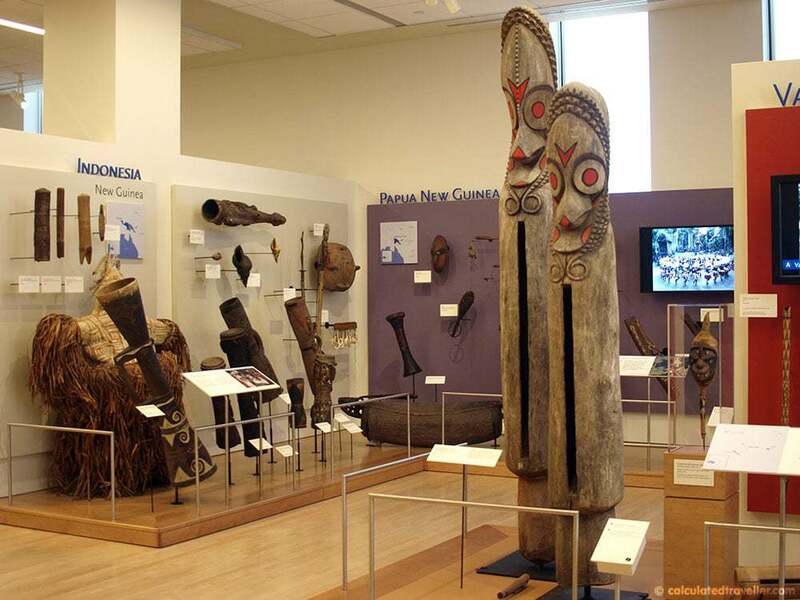 There are five significant regions represented in the Geographical Galleries: Africa and the Middle East; Asia and Oceania; Europe, Latin America and the Caribbean; and the United States and Canada. I was told by one of the volunteers on duty that the best way to tour the museum was to start in the Orientation Gallery and then move upstairs to the Upper level to see the Geographical Gallery then return downstairs to the Artist Gallery/Experience Gallery and Mechanical Gallery. This route proved to be a wise path to take. The oldest instrument on display is a paigu or hourglass drum and dates back to China’s Neolithic period. Estimated to have been created between 5000 and 4000 BCE. All you hear is silence and the soft treading of footsteps as museum goers quietly walk from display to display listening to their audio guide headphones. The state of the art equipment (included with admission) is provided to you as you enter the museum. Approach any display in any random order, and the proper “soundtrack” plays in the headset, walk away from the display, and the “soundtrack” stops. It’s as if each person is getting their own personal tour through the museum. 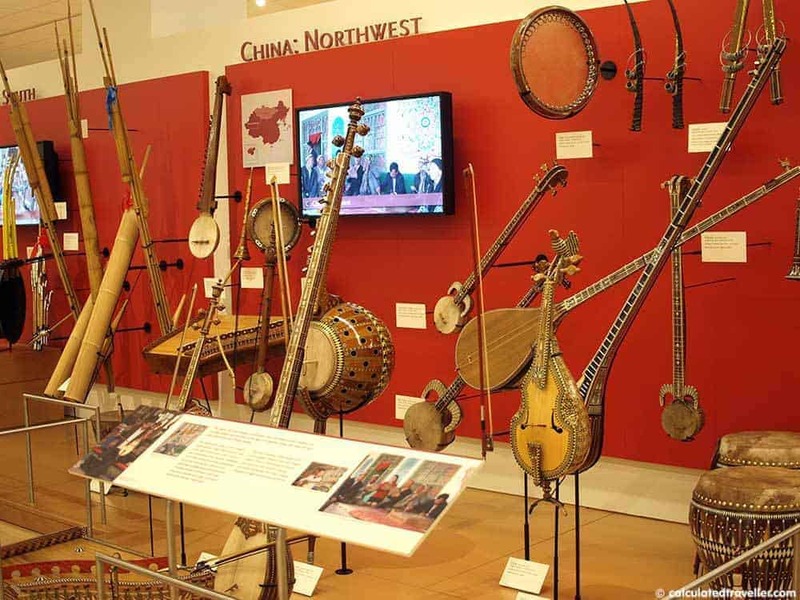 At most exhibits, there are also video displays showing the instruments in use in their specific cultural setting. Very often the video footage shows the very same instrument that is on display! There is even footage of artisans building and crafting the instruments themselves. The Artist’s Gallery features musical instruments linked to famous musicians as well as video footage of their performances, photographs, costumes and awards such as real Grammy awards and gold records on display. This gallery is definitely a must see. 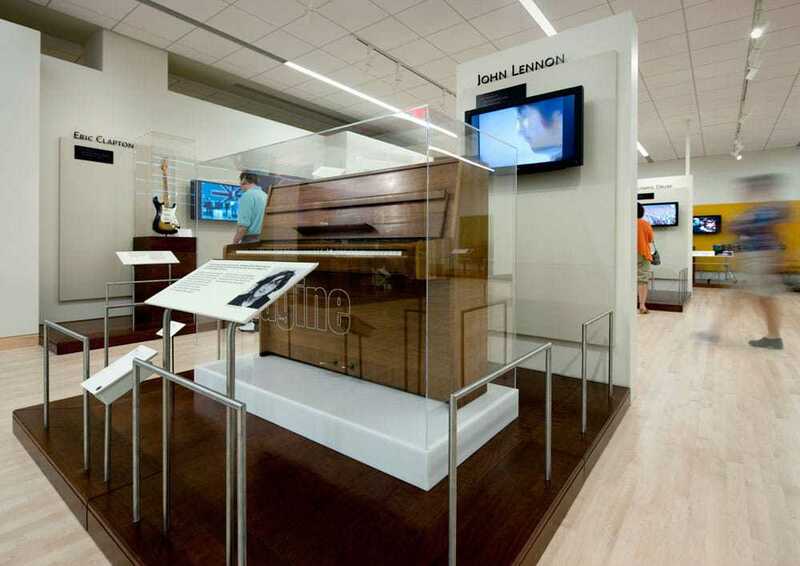 I can imagine (wink) that the Steinway piano that John Lennon composed “Imagine” on is a very popular exhibit as is the George Harrison, Taylor Swift and Elvis displays. Look out for one of the “Fou” drums from the opening ceremony of the 2008 Beijing Olympic Games. Experience Gallery – so that’s where all the noise is! We didn’t spend much time in this part of the gallery truthfully because we were so tired from seeing everything else, but this is total play time with all sorts of instruments available for you to try your hand at. Great fun for the kids. 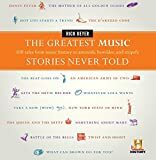 The Musical Instrument Museum demonstrates that even though the world may speak different languages, worship different religions or live in different countries; what we all have in common is music and music truly is the language of the soul. I enjoyed my time at this impressive museum and highly recommend it for any music lover. Be prepared to stand and walk a lot. There are 80,000 square feet of exhibition space, and I noticed that there aren’t very many benches/seating areas within the galleries. If you need to rest, there are seats in the main hall areas. Plan to be at the Museum for a few hours. There is a lot to see, hear and experience. Note: Thank you to Musical Instrument Museum and Scottsdale Convention and Visitors Bureau for complimentary admission in exchange for this review. The opinions expressed, positive and/or negative, are entirely that of the author and are not a reflection of the compensation received. Looking for outdoor adventures nearby? I would love to visit that museum! I’d never heard of this museum before. A lovely collection of instruments. How amazing to hear the instrument as you step near it. What a well planned way of displaying the musical instruments. I can’t wait to visit too. I love learning about and visiting unusual museums. This looks like a good one! Great stuff Mary! I like the photos too! I never really had the energy for these kinds of activities but when I saw John Lennon in one of your photos, I´m definitely in for the 80,000 sq ft marathon! Not sure if you are also a Beatles fan or just a Lennon fan, but they also have a George Harrison exhibit as well as a guitar with Sgt. Pepper artwork all over it that was pretty incredible. Also, this may sound odd, but I thought that Lennon’s piano would be bigger….just saying…. The MIM opened after we moved from Phoenix to Italy. I really need to visit on one of my trips to Phoenix.